Hello, We have just had a litter of Olde English Bulldogge's. They were born on January 26th, and will be ready for their new homes around the 20th of March. We have 5 females and 4 males. I have attached pictures of both mom and dad. Mom has matured at a healthy 65 lbs at 2 years old...she is the white dressed up like a pumpkin in the picture. Dad is the beautiful glossy black and white, and at 8 months old is already 70 lbs. Both mom and Dad are registered, however we are not registering the pups. That is why we are only asking $1,200 for them. They will however come with a 1 year health guarantee, their first set of vaccinations, vet check up and deworming all before being re-homed. We are asking for a non-refundable deposit of $200 to hold the puppy of your choice once chosen. Please respond to this ad if interested, and I will get back to you as soon as possible. ** 1st pic is of 2 blue females, 2nd pic is of the male and female brindle and white up close. 3rd pic is the blue males, brindle male and reverse brindle female. 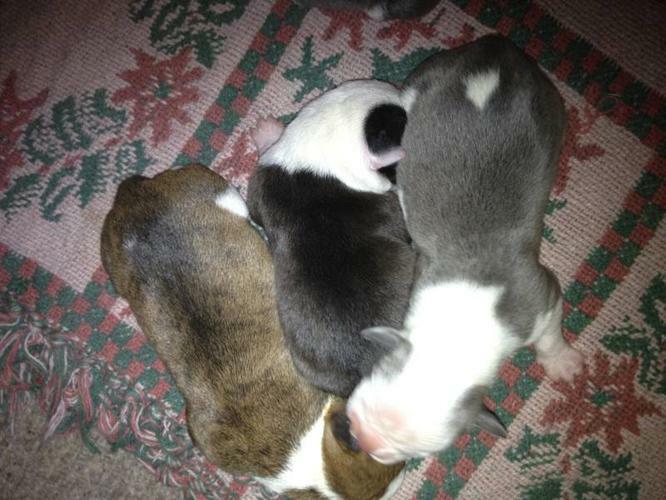 4th pic is the blue female (right side), blue male (middle) and brindle male. 5th pic is dad, and last pic is mom.